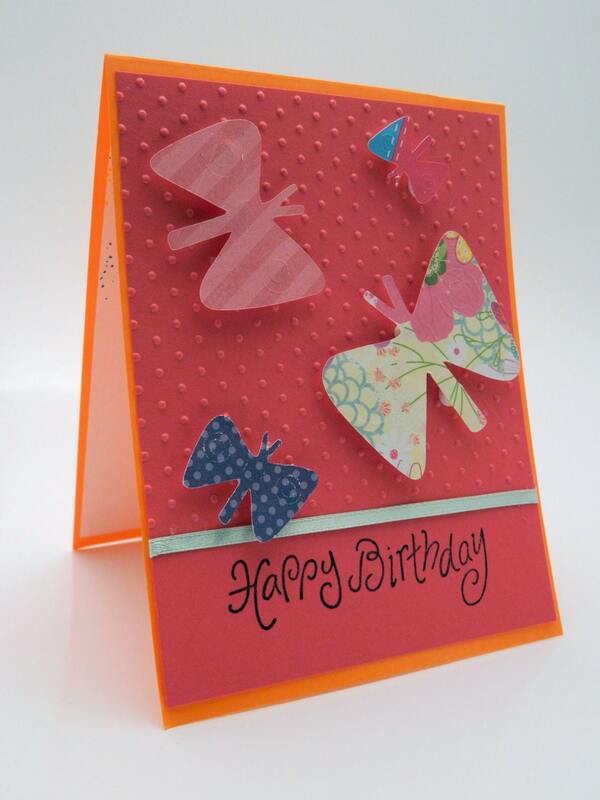 A beautifully feminine orange and pink birthday greeting card featuring an assortment of die cut butterflies. Each butterfly is created with different, yet coordinating patterned paper. They are attached using foam dimensionals. The card base is made from fluorescent orange smooth cardstock. The overlay of hot pink smooth cardstock is enhanced with dry embossed polka dots and mint green satin ribbon. The "Happy Birthday" greeting is hand stamped in eggplant ink. The inside is lined in bright white cardstock which is accented with a spray of yellow, blue and pink ink. The inside verse "you're a wonderful reason to celebrate!" is hand stamped in eggplant ink. Folksy :: Buy "Beautiful Butterfly Birthday"
Folksy :: Buy "Victorian Stitched Birthday"
Folksy :: Buy "Handmade OOAK fairy butterfly catcher stamped birthday card "Just for You""